A year of traveling around the world, hundreds of thousands of flights, millions of passengers. eDreams has studied and analyzed reviews from more than 70,000 travelers to compile a list of the best full service airlines in the world for 2019. Turkish Airlines has always been my preferred choice. An excellent airline! The Emirates company is excellent in treatment, service, quality, punctuality, order and professionalism. Great flight! It's fantastic that you get a free meal and drinks, which is becoming very rare in an airline now. This makes the experience different from the rest and I will be flying with Aegean Airlines again! Nothing to say. Everything was perfect! Flight was in time with good and friendly service onboard. Great service. I'll be definitely traveling with you again! Smooth and trouble free. Good on board and ground service. I would fly Swiss Air again! Very nice flight with very friendly crew. Nice, clean & quiet aircraft with pretty quick check in. Awesome! So far one of the best companies I've traveled with. Wondering which airline is the best for traveling in 2019? The results of the Top 10 Airlines are available! 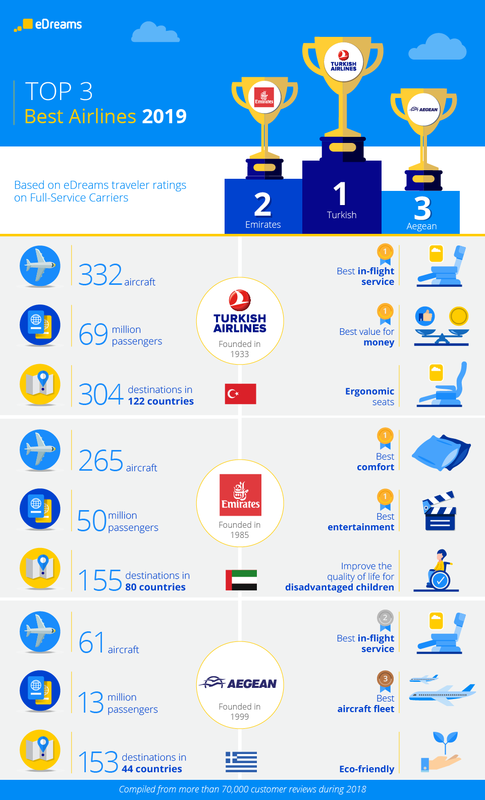 For two years in a row, Turkish Airlines achieve the first position of the ranking. Moreover, winning first place for in-flight service and value for money. Next slot is for Emirates, who boost their standing after being 6th position last year . Besides, they also won best aircraft category and best entertainment category. Last but not least, we have Aegean Airlines in third standing. Air Corsica, Aerolíneas Argentinas, Finnair, Middle East Airlines, and Etihad Airways made it to the list this year. On the other hand, Swiss International Air Lines descended 4 spots upon being in the top 3 last year and Aeroflot fall only one position. According to all of your reviews, these airlines stand as the top-notch of the world. Now that you learn about the best airlines, you should worry about booking a ticket and packing for your next trip! Turkish Airlines was founded as the national Turkish airline in 1933. Originally, it started with 5 aircraft, however, it already has 332 aircraft, transporting 69 million passengers to over 304 destinations in 122 countries. Kamel Turkish Airlines confirms its reputation: nice organization, recent planes, screens and earphones for each seat, tasty and quality meat, perfect crew! Yaiza Now I understand why Turkish Airlines is one of the best flight companies. It's great how they have organized how to do check in, since there is not much queue. The customer service is extraordinary. The air conditioning is perfect and the gift of toys given to children is a good detail. 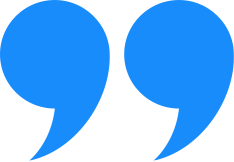 The best airline, according to eDreams travelers, is distinguished by the cordiality of its employees and the added value they provide to their consumers. They strive to innovate to offer their clients a memorable travel experience. Do you have to wait for your flight? With Turkish Airlines, you can enjoy lounges with internet, games, movies, snacks and massages at the airports of Istanbul, Moscow, Washington DC and Nairobi so you don't have a never-ending wait. In addition, Turkish is renewing its seats to ergonomic to increase the satisfaction and comfort of travellers. At each stage of your trip, you are covered with Turkish Airlines! Emirates has embarked on its journey with only 2 aircraft in 1985. Its fleet consists of 265 most modern and efficient aircraft, in which this last year 50 million passengers have traveled to 80 different countries and over 155 different destinations. Bert Very good trip, air staff very friendy, and aircraft clean and tidy. Farselars Emirates is a great airline. They have all the luxury on board, super friendly multinational personnel and they take really good care of their customers. Emirates users highlight the excellent comfort, the ease of checking in, the modern aircraft and the variety of entertainment offered by the airline. It has entered the Top 3 of the best airlines for its achievements and for being a company that values society. The support for children with shortages through the Emirates Airline Foundation, the saving of fuel and emissions via alternate routes that save time and gasoline and using a single engine during the runway and recycling are some of the actions carried out by this airline to contribute to the world. Aegean Airlines began its journey in 1999 and since then, has achieved increasingly ambitious objectives: 61 aircraft, 153 destinations in 44 countries and more than 13 million passengers transported annually. In addition to the mentioned milestones, this airline was valued by the users as one of the best with in-flight service, value for money and modern aircraft. On the other hand, it is a company that cares about the environment and society as considering the several initiatives carried out. Nata We had a fabulous flight, the staff on board were attentive, well presented and polite and good food! Congratulations! Simón This was the first time I've flown with Aegean Airlines. Definitely the best in-flight service I've ever received from any of the 30-plus airlines I've flown with. Toward the goal of contributing with less fuel consumption and, therefore, reduce environmental impact, they have opted to install lighter seats and implement fuel saving techniques with new software. They also recycle waste inside and outside the plane and have created a compost system to fertilize the airport in Greece. Want to know more? Follow us on our social channels!